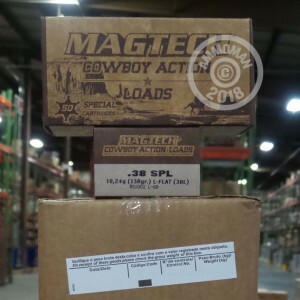 Cowboy action shooters will appreciate the low recoil, solid accuracy, and carbine-friendliness of this ammunition from Magtech. These .38 Special cartridges fire a heavy 158 grain lead flat nosed bullet that feeds safely in long guns with tubular magazines and punches nice, clean holes in paper targets. A muzzle velocity of 800 feet per second keeps recoil to a low, comfortable level. Magtech ammunition is loaded in Brazil by defense contractor CBC. It uses non-corrosive Boxer primers (a welcome advance from real cowboy ammo!) and reloadable brass cases. Grab this case of 1,000 if you've got a lot of action shooting coming up and save with free shipping from AmmoMan.com (applies to all orders over $99).